KIT FOR Z650 MODELS This is the latest CDI kit from boyer including 2 ignition coils: Electronic ignition systems are now standard fitment on most new motorcycles. This is because they offer better starting, smoother running, improved fuel economy, lower emissions, greater power output and vastly improved reliability. All older motorcycles will suffer from "fragile" electrics. Components will have deteriorated, due to the effects of dampness, heat and vibration, over the years. Original parts often cost a small fortune to replace and many pattern parts, whilst cheaper, are of inferior quality. Boyer Bransden ignition systems have been in continuous production, for over 35 years. They were originally designed for and fitted to Grand Prix racing motorcycles. They are still the ignition system of choice, for many modern racers, These systems replace the standard contact-breaker points, condensers, mechanical advance/retard unit, ignition control box and coils. They are fully encapsulated and are guaranteed for five years. They come complete with full fitting instructions and all the necessary connectors, as shown in the picture. The Micro-Power ignition kit contains a micro-processor which analyses engine speed, ignition coil energy and engine load, making more than 1 million adjustment decisions per second. Ignition advance and retard is monitored in bands of only 50rpm over the entire engine speed range. The technology involved is superior to the systems fitted to many modern superbikes. The control over the entire ignition function is of such a high level that the standard ignition coils are far too inefficient. Their primary resistance is too high, wasting electrical energy and producing a comparatively poor spark. 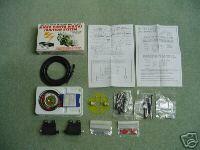 Therefore the Micro-Power kits contain special digital coils matched to the ignition system. Due to the computerised control of the ignition cycle, over a very short period of time, the digital coils receive an ultra-high current pulse. This requires a much lower resistance in the coils. The result is an ignition system where current consumption is more than halved, but spark intensity is much greater. Average consumption is less than 1.5 amps at maximum rpm.